Just like in the code shared previously, you can visually see that the low levels PWM between zero and 1×7135 at 16 kHz. 100% 1×7135 is of course without PWM. Mid modes above the single 7135 are PWM’d between that and the 6×7135 channel at 16 kHz. (1+6)x7135 is again without PWM. Then it PWMs at 32 kHz between the 1+6 and FET and finally transitions to full FET. On a side note, at some point I’d like to reduce that 32 kHz to 16 kHz, but the attiny85’s second PWM counter works differently than the first. I’m not entirely sure it can run at the same speed. It looks like the Mid modes are PWM’d between 1×7135 and (1+6)x7135 (i.e., the 1×7135 channel is always 100%), aren’t they? Oh yeah, exactly like that. Yes, the 1×7135 power channel stays on, steady, when the Nx7135 channel is active. And both stay on, steady, when the FET is active… Except for the very last ramp step, where it’s FET-only. Nearly all multichannel lights since the BLF-A6 have done things this way, because nobody has found a better solution yet without major hardware changes. Just fyi here, I recently, like last week, tweaked NarsilM to run FET+1 on a triple channel driver. I did this in order to use a TA 30 mm triple driver, sanded down to 28 mm, in a Maeerxu M8 without using up my very limited supply of the "good" 7135's. 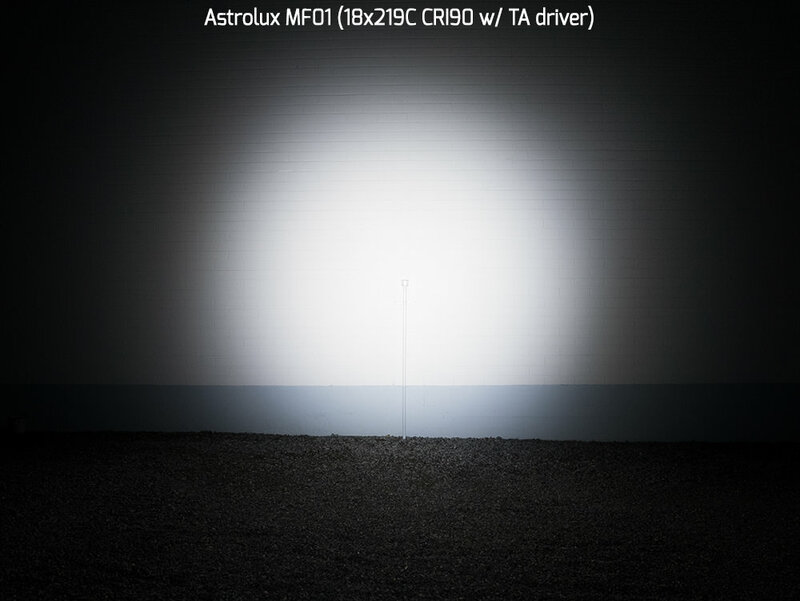 So in theory if this flashlight uses the regular design "TA" design for the triple channels, it can also run as a FET+1, Q8 style, just not taking advantage of the bank of 7135's. Wish I could find a source to buy the good 7135s at reasonable pricing. Just fyi here, I recently, like last week, tweaked NarsilM to run FET+1 on a triple channel driver. I did this in order to use a TA 30 mm triple driver, sanded down to 28 mm, in a Maeerxu M8 without using up my very limited supply of the “good” 7135’s. So in theory if this flashlight uses the regular design “TA” design for the triple channels, it can also run as a FET+1, Q8 style, just not taking advantage of the bank of 7135’s. Wish I could find a source to buy the good 7135s at reasonable pricing. That's the German Ali, to US, shipping more than doubles the price. For the global site at the same named store, it's a different deal qty 10 for $1.51 no tracking, or if I order 100 (10 of qty 10), it's about $20, 0.20 each with tracking. Think I'll order the 100 deal w/tracking. Hope I get what they pictured though - the "raptor claw" versions? Last batch I ordered from somewhere sent me the bad versions. Ali had been real good though with refunds when you don't get what you expected. Wish I could find a source to buy the good 7135s at reasonable pricing. I wish do that for you. I just paid bout $20 for 100 shipped w/tracking. Might be able to find them cheaper. Old pricing for us used to be 50 cents (Illumn, IOS, etc. ), than FastTech became the defacto standard supplier here: fasttech-qty100-amc7135-350ma, for like 8 cents each at this qty, but no longer could guarantee what version they would send you. I'm hoping this Ali store will at least ship out what they show in the picture. What I don't particularly like is that changing the batteries resets the light back to ramping mode. It definitely should not do that. All settings (modes, thermal, etc...) should be stored permanently unless you go into the menu and change them. This will need investigating. I found one potential bug in this are. This is a triple channel driver, so in this state, it's possible to choose mode sets 9 to 12, except they don't exist for a triple channel configuration. What happens as a result is uncertain - it accesses invalid locations in memory, so who knows what bad data references will result in. Is it possible you tried selecting a mode set above 8? No, I’ve only used the default mode set (4) with four modes + moon. No, I've only used the default mode set (4) with four modes + moon. Actually, I’m a bit worried about the extreme difference between advertised and measured lumen output of the XP-L HI NW. If I recall correctly the ANSI method states lumen output at/after 30s of runtime. 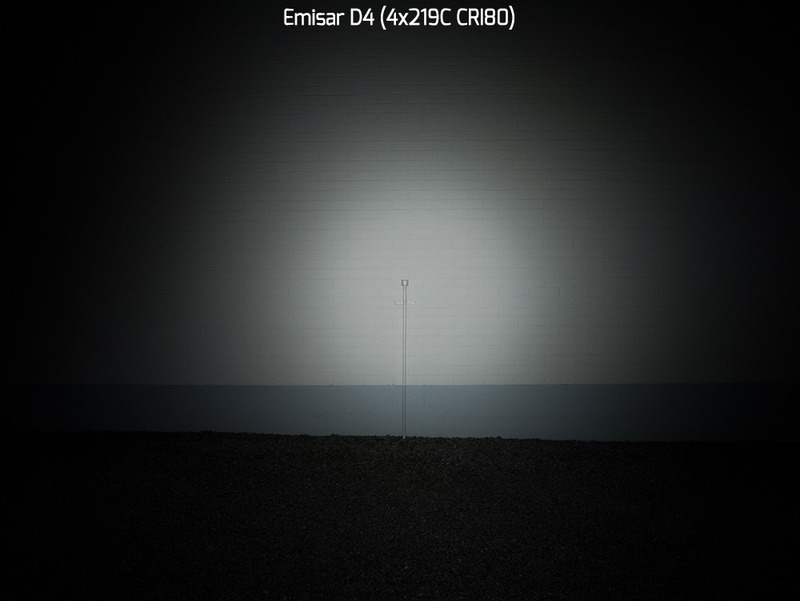 So, we have 6.650lm vs. 10.000lm (for the cw V3 1A), i.e. 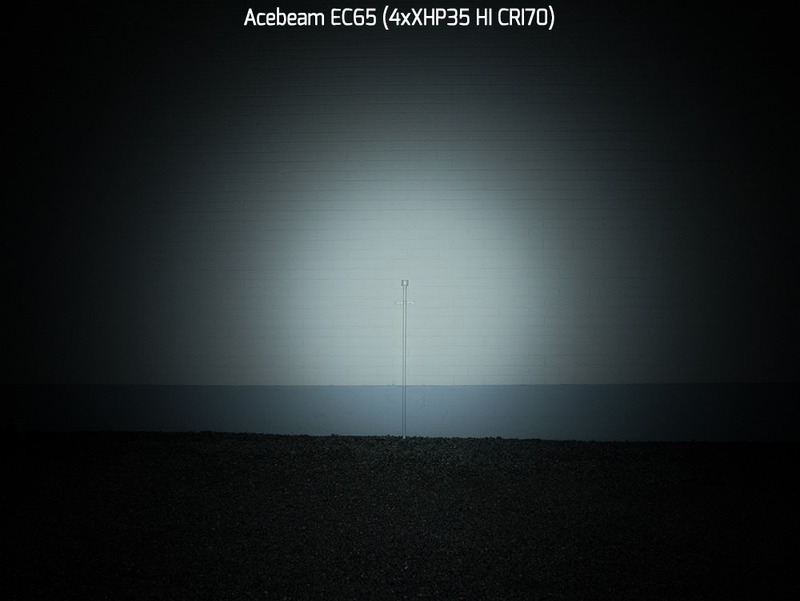 this flashlight only achieves 66.5% of its advertised specs, is that correct? Okay, one could say the nw version might have A BIT lower output – even though it’s the same V3 binning – but 33,5% less seems far too much to me. I’m not even using those expensive VTC5A with low internal resistance but the usual VTC6. Thus I might experience even less lumens than charles lin did with his light. I’m also wondering how much regulated output would remain with 14 AMCs on the board. Fireflies test of the 219B version in a 1.5 meter integrating sphere reports a peak reading of 5236 lumens running on 3 VTC6 cells. So what is the equivalent peak lumens reading Maukka got? I can't find it in the posted result in post #135. I think first we need to see apples to apples. Then take a look at what that reading really means - Fireflies posted integrating sphere report is probably instantaneous, not at 30 seconds. Of course it would be great if Fireflies and Maukka used the identical light, identical cells at the same charge level, but I suppose that's not happening? If not, we should expect a possible swing of 5-10% but I think it should be closer than that. Even if you have 7% LED variance, the chances of all 9 LED's varying the same way is pretty remote. These integrating sphere are all terrific, but they require meticulous usage, regular calibration, and understanding and proper reporting of the results. 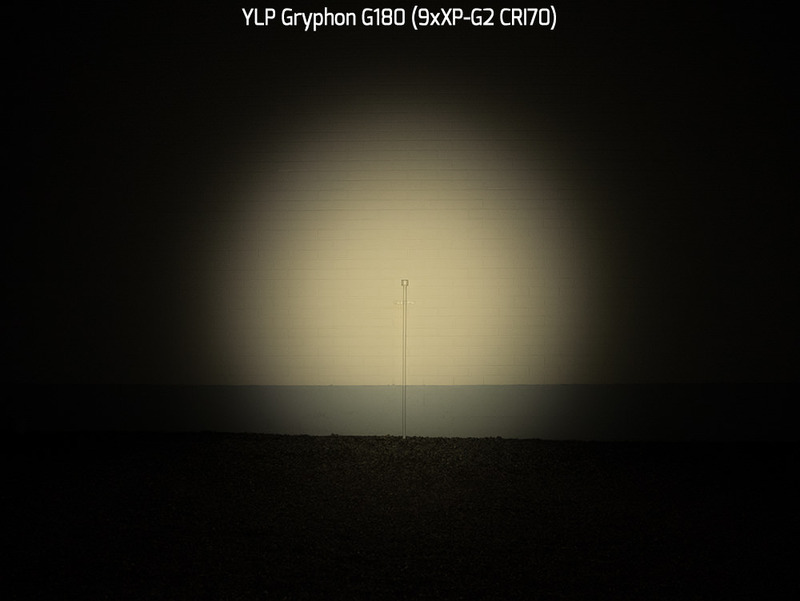 Looking at the XPL-HI V3 CW report, it's 9660 lumens at the peak. So I guess Fireflies rounded up to 10000 lumens, but still it's a peak, not after 30 seconds. So Charles lin reported in post #197 he measured 7480 lumens at the peak on VTC5A cells. That's still a big difference of 22.6%, so the questions are is someone's measurements tools way off or are the 2 lights compared different in some way? So what is the equivalent peak lumens reading Maukka got? I can’t find it in the posted result in post #135. I think first we need to see apples to apples. Then take a look at what that reading really means – Fireflies posted integrating sphere report is probably instantaneous, not at 30 seconds. Of course it would be great if Fireflies and Maukka used the identical light, identical cells at the same charge level, but I suppose that’s not happening? If not, we should expect a possible swing of 5-10% but I think it should be closer than that. Even if you have 7% LED variance, the chances of all 9 LED’s varying the same way is pretty remote. And the step-down setting should also be taken into consideration. My ROT66 will step-down before 30s when the default is used. And, with three VTC6s, when step-down is completely disabled, I got ~5050 lumen at 0s and ~4500 lumens at 30s. My DIY sphere is not supposed to be accurate but the relative difference between 0s and 30s was ~10% then. Still testing, but I get 4325 lm at turn on, 3860 lm at 30 sec with 3×30Q. Complete review coming in a couple of days. I changed the temp limit. Mine was stepping down a bit too prematurely with factory settings. Now it steps down at about 60 sec. Should back up a bit since it’s getting up to 65°C right now. Wow, that’s lower than my expectation. Since the Turbo is driven by pure FET and thus can vary greatly due to numerous reason, maybe we should take the max regulated brightness (7×7135) as a base. 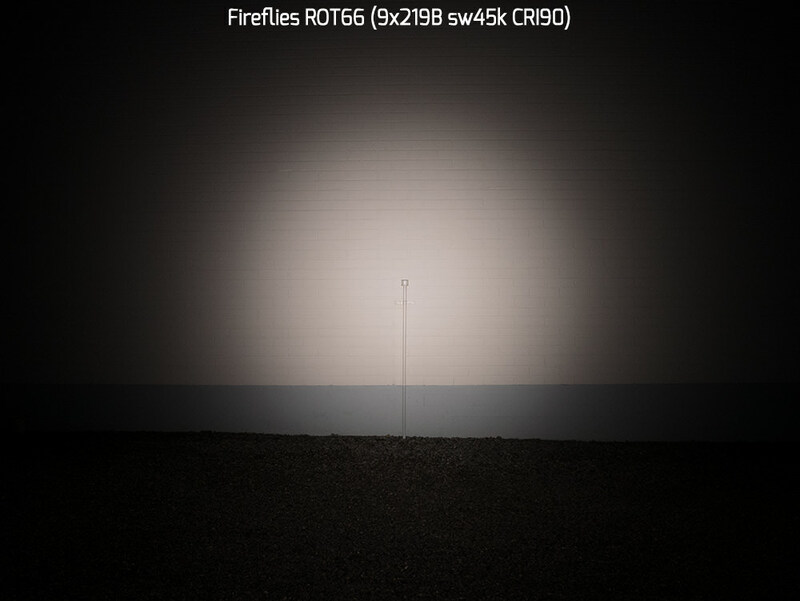 On my ROT66, the peak output is 5050 / 715 = ~700% if compared with the stabilized 7×7135 brightness. Or 5050 / 740 = ~680% if compared with 7×7135 at 0s. 30Q's should get lower results than VTC6's, but not that much lower based on my Q8 tests - this is 17.4% lower than Fireflies integrating sphere results. So something is off, or the lights tested are different, or little of both. On 7×7135 mine is 710 at 0 sec. So peak is 609% (6.09*710=~4325). On 7×7135 mine is 710 at 0 sec. So peak is 709% (6.09*710=~4325). 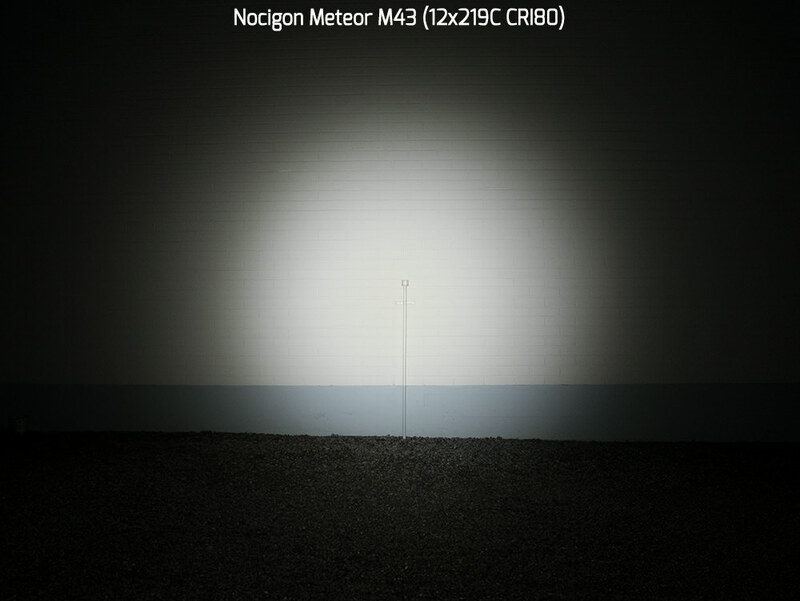 After several tests with cooling the light in between the most I got at 0 sec was 4413 lm. The 4325 lm is an average out of three. Using VTC5A didn’t make any real difference, 4440 lm on average with a max of 4500. What is the actual lumen number you got on the max regulated with your integrating sphere? So that’s ~630% of 7×7135 at 0s. With 3 x NCR18650GA cells, I got ~4650 at 0s, which is ~630% of 7×7135 at 0s. With VTC6’s, that ratio is ~680% (5050 / 740). Some white wall beamshots from TIR lights. The ROT66 will be great for night photography in a US ghost town. Wonder what a minus pink filter would do for it in terms of subjective and objective differences? Of if the AR coated lens has a tint that’s green/magenta that also slightly affects tint? Similar test result with either VTC5A or GA. I took time redo calibration for my TA tube. Now, my 219B ROT66 with 30Q’s measures 4440 lumen at 0 second, 3910 lumen at 30 seconds.